After a few months of scouting out potential restaurants to review in the Des Moines metro area, I begin with a review of this gem tucked away in a professional building. 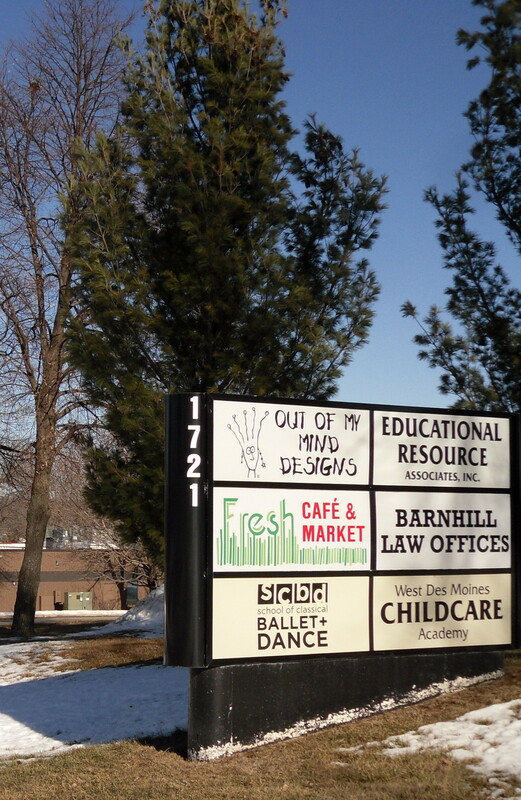 I first became aware of this place when I saw their booth at the Downtown Des Moines Farmers Market. A tray of fresh wheatgrass, sitting in the booth, caught my attention. Kerri Rush, “the wheatgrass girl” is the owner, farmer and chef at Fresh Wheatgrass Farm in Carlisle, Iowa and Fresh Cafe & Market in West Des Moines, Iowa. She started growing wheatgrass in 1996 when her Mother was diagnosed with stage 4 colon, liver and lymph node cancer. 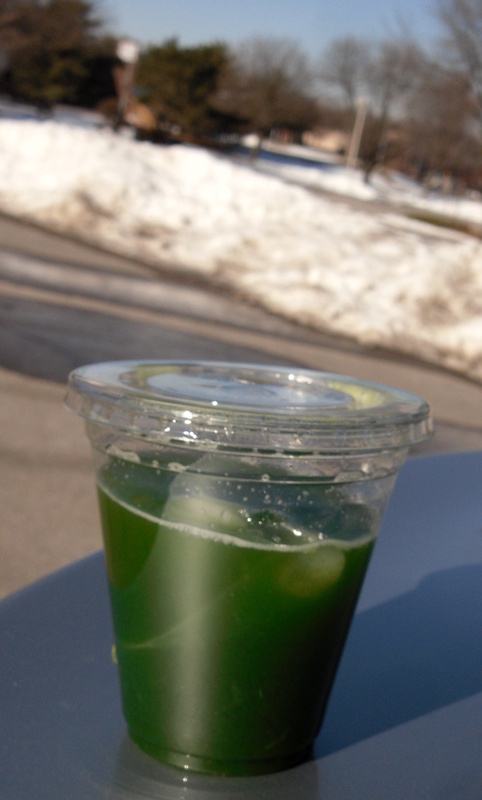 After researching “alternative” healthy ways to give her immune system a boost she found it in wheatgrass and juicing. (her mother is now cancer free!) Kerri became hooked on all of the benefits of wheatgrass and her business started growing! According to the menu the rest of the food is organic, local, gmo and synthetic-free. They proclaim that they change their menu often because they work with fresh, seasonal products. This vegan chorizo is loaded with flavor and you can see the presentation is attractive. 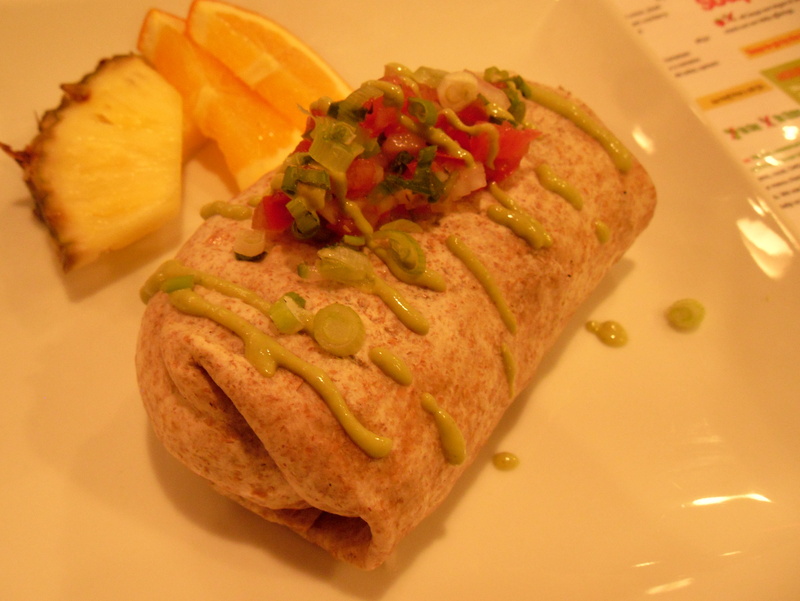 The “chorizo meat” is made with quinoa and roasted potatoes, poblano peppers, and corn. I had a choice of whole wheat or gluten-free tortilla. I selected the whole wheat. The topping is cilantro-chile crema and fresh scallions and tomatoes. It was a surprise to find such yummy food in an odd looking professional building. At first I was excited because I saw a woman with five little girls come out and get in a van. I thought maybe they were Girl Scouts working on their locavore badge. You know, touring the kitchen to learn about food. Then I realized they had not been at the cafe, they had been dancing in the room next door. Three of the walls are each painted a different bright color and the fourth wall is glass which makes for a dramatic and vibrant cafe. The tables are sturdy wood with substantial chairs. You order at the counter and the food arrives quickly. I’d like to see Fresh Cafe and Market or other favorites like Desert Roots Kitchen, populate the malls, downtowns, and suburban intersections of every city in America. Making food this good takes a huge amount of effort. The commitment to quality is the reason we do not often see these types restaurants that offer truly fresh food at a lower this price point. I leave you with this picture that proves you can get something fresh on an Iowa winter day.